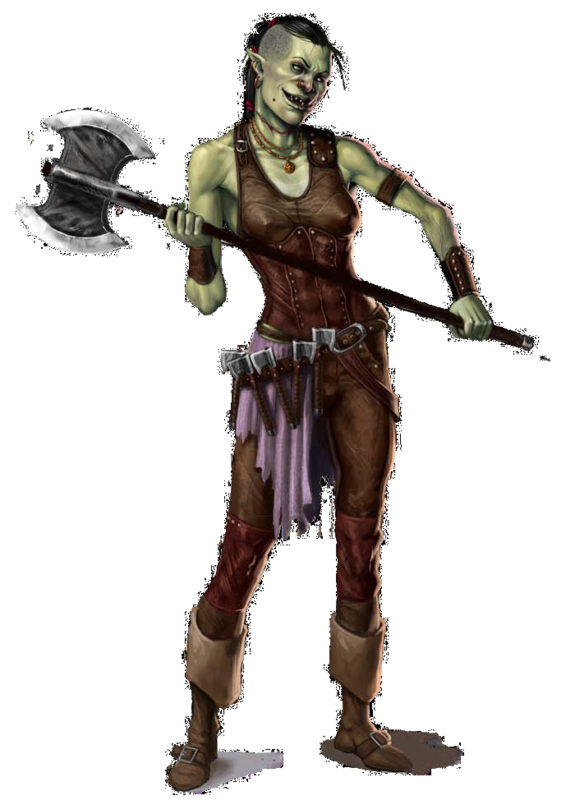 Cut-Throat Grok (N female half-orc fighter 5) is the Wormwood’s quartermaster, a no-nonsense character with a huge scar across her neck. Growing up among pirates is tough for anyone unusual, and Grok got her scar fighting a gang of cutthroats in the alleys of Port Peril who robbed her and left her for dead when she was only 11 years old. Grok is a reedy half-orc who favors dark clothing. She carries a notched greataxe and an array of throwing axes hangs from her belt. Grok frequently grins toothily, and uses appalling curse words, particularly when drunk. Grok is renowned for being tough, and she doesn’t suffer fools, but she is a close friend of Ambrose Kroop, whom she sees as someone who’s had even worse luck than she’s had. Grok is usually found in the quartermaster’s store (area A9) during the day. In the evenings, she locks the store and carouses on deck, drinking and gambling with the other pirates before returning to her cabin (area A7) to sleep it off. Grok loves unusual drink and fine songs, and a character who provides her with at least 20 gp worth of alcohol that isn’t rum or who makes a successful DC 15 Perform (song) check gains a +4 bonus on all checks made to influence her. If Grok is made friendly, she allows the PCs into the quartermaster’s store after normal hours, where PCs can negotiate for equipment with her with additional Diplomacy checks. Recovering a PC’s starting equipment is considered simple aid (DC +0), a loan of goods worth up to 150 gp is considered lengthy aid (DC +5), and a loan of 300 gp worth of equipment is considered dangerous aid that could result in punishment, since she might get keelhauled herself for theft (DC +15). Story Award: Award the PCs 400 XP if they make Cut- Throat Grok helpful.